[Hello Prilon.] Hi Suzy, I am here to say that we are evolving into One. [You and I or we and All?] We and All and you and I. Universally we are transcending the timelines and we are melding into one consciousness. How ‘we’ or ‘you’ experience this is how we are connected to love. Under the laws of duality this experience is individual. Under the Law of One it is experienced as a group awareness. The Law of One is the wave or current that gives vibration to the planet now. This is opening portals to connectiveness and love. With this all in play, your planet is on track for an evolutionary jump. Soon you will know without a doubt that you have made it home to the new Earth. Little by little you are remembering its way of beauty and peace. Give yourself a rest when needed as this is a lot to assimilate to. The human factor brings with it limitations and you are shedding these limitations with abandon. Forgetting your Source connection is what you agreed to prior to this existence; re-membering your Source connection is your purpose. 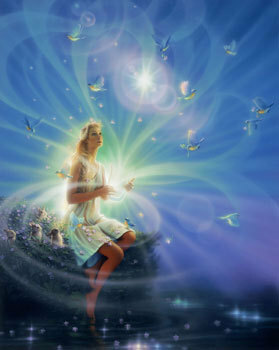 Giving love & light will be your soul purpose next. This is the way for many, many souls. Be in the vibration of love by loving self and others. Picture abundance and joy. Imagination is the best teacher to expression and creation is the result of love. Quickly your world is changing and there is no need to try and make sense of it all. Be in your heart and there you are as me.